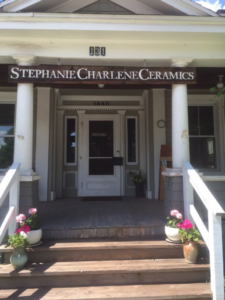 Stephanie Charlene was an archeology major until she took a life-changing course in pottery. As she had learned, ancient civilizations left pottery shards behind—often the only clue to their communal life. 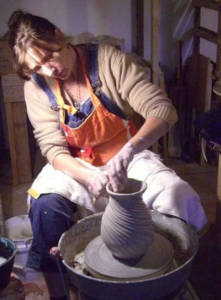 Here she sat at her wheel creating new pots, an exciting, fulfilling art, both fragile and lasting. Now Stephanie Charlene spins her wheel on Main Street in Andes. With sure hands she pulls up the supple porcelain into shapely pitchers, lovely bowls, sturdy steins and plates—all offered for sale in her shop at 131 Main Street. She melts beeswax into shallow bowls and lets it set around multiple wicks for a healthful glow on your table. Born in Washington, D.C., she spent her first 5 years in the Champagne region of France which may account for her sparkle. Later she lived in D.C. but spent summers back in France. After discovering ceramics at James Madison University, she taught at Gardner-Webb University in the Blue Ridge Mountains, and then moved with her daughter to New Jersey to be near her mother and sister. But she still longed for those mystical Allegheny Mountains, so almost 12 years ago she bought a house in Bovina. For the last 5 years she has lived there full time. Her pottery business has always been evolving. She sells wholesale through Uncommon Goods and Shaker Workshop. She collaborates with the chefs in 2 Michelin-starred Brooklyn restaurants, creating unique porcelain plates to set off their food. Most of her work is now porcelain, with some stoneware. She has had pieces on sale in the gift shop of the National Gallery in Washington. Gradually, in Andes, she is going from all wholesale to retail, which she finds more rewarding. She enjoys meeting the people who buy her work for themselves or as gifts. It feels more meaningful to her. And, without doubt, it enhances the value of the pitcher or bowl you buy to meet the artist whose skillful hands created it. She is moved when she receives notes of appreciation. She mentioned one from a man whose father had recently died leaving him holding one of her steins that the son had given his Dad, a memento full of precious memories. Stephanie expects to have her shop open on Saturdays and Sundays, from 10-5. Want to play with clay and try your hand at throwing a pot? She offers one-on-one tutorials. Look on Facebook for The Potter’s Schoolhouse. Upstairs she has 2 Airbnb rooms. The link is: The Potter’s House.